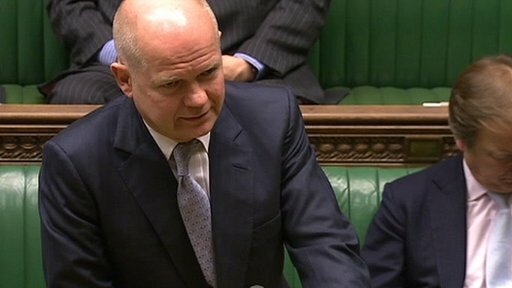 The UK could start arming Syrian rebels, Foreign Secretary William Hague has warned MPs. Speaking during a statement on the latest situation in Syria on 10 January 2013, Mr Hague said he would ask the European Union to lift its arms embargo to the country. This would pave the way for the government to start arming the Syrian rebels fighting President Bashar al-Assad's regime, although Mr Hague said the UK would focus its efforts only on moderate political forces. He told MPs: "Clearly the best outcome for the Syrian people would be a diplomatic breakthrough, bringing an end to the bloodshed and establishing a new Syrian government able to restore stability. "However, we must keep open options to help save lives in Syria and to assist opposition groups opposed to extremism if the violence continues. We should send strong signals to Assad that all options are on the table." But Liberal Democrat MP Sir Menzies Campbell warned Mr Hague about any extension of policy that may result from using the phrase "all options are on the table". Mr Campbell said: "This is a civil war and intervention in civil wars has a long history of failure. "There is a risk that we will have a proxy war between Russia and NATO fought out on the streets of Syria by Syrians." Labour's Peter Hain said the choice of words used by Mr Hague could be a prelude to western backed military intervention, which would be "disastrous". But Mr Hague said Mr Hain should not argue with something he had not said, and agreed that the dangers and difficulties of military intervention were "well understood". The United Nations has said that 60,000 people have died in the conflict in Syria since the violence began in March 2011.